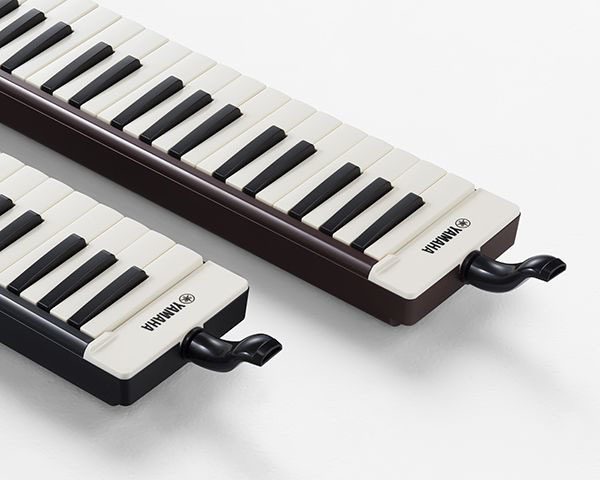 Yamaha has announced a new breath-powered keyboard instrument, the P37E Pianica. With a nod to the melodica, this instrument combines the sounds associated with wind instruments with the familiarity of a keyboard instrument. The sound is described as being somewhere between that of a harmonica and an accordion, ye4t is supposed to have more body and depth than other melodica-style instruments. The lower half of the pianica is constructed from Ecodear plastic, an environmentally-friendly plant-based material offering improved performance over plastics such as ABS. It resonates in a similar fashion to natural wood. Internally, it’s designed to reduce unwanted overtones, and contribute to a more organic tone. The pianica is touted to have excellent tuning stability, which is important as each note has its own reed. It features a three-octave note range from the F below middle C upwards. Aesthetically, Yamaha has gone for something more sophisticated, claiming the instrument will look more at home in formal settings. That said, this isn’t likely what the pianica’s primary intended purpose is. Available in black or brown finishes, it also comes with a mouthpiece extension tube and custom-fitted zippered carrying case. Due to ship in the first quarter of 2019 with a RRP of $151.99.